In summer 2014, Library and IT, with support from the Andrew W. Mellon Foundation, awarded student-faculty summer research grants to five different projects. The grants were designed to support work being done by undergraduates participating in faculty-generated digital research. One of the awards was given to Prof. Amanda Wooden (Environmental Studies) for her project “Refracting Environmentalism Through a Tire: A View of ‘Fractivism’ Through an Anti-Incinerator Campaign in Central Pennsylvania.” Prof. Wooden worked with a team of students, including Nicole Bakeman ’16, a Managing for Sustainability major, and Jaclyn Tules ’15, a Geography major on collecting and analyzing data for the project. 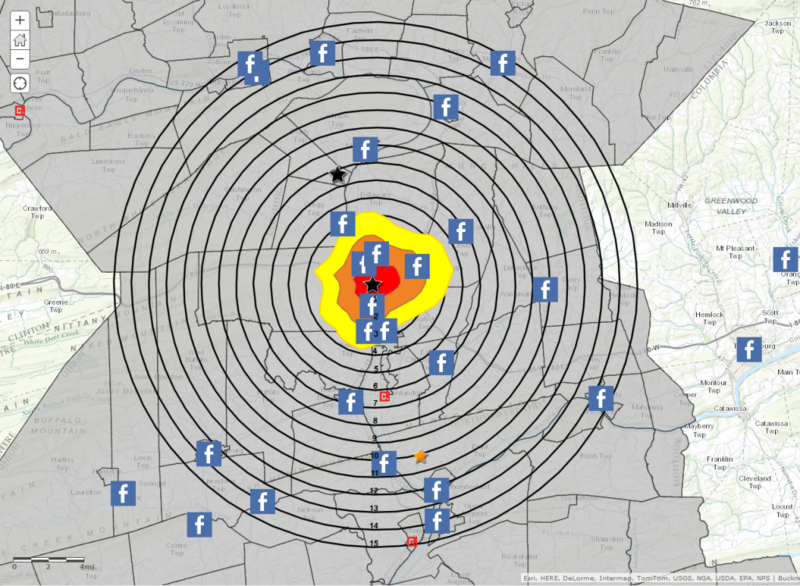 The project explores the connections between opposition to Marcellus Shale drilling (“fractivism”) and opposition to a proposed tire incinerator in our sub-region of Central Pennsylvania – a rural, rapidly-industrializing area. There are fascinating connections and divisions among activists and in public opinion about these two issues. The comparison reveals much about the dynamic nature of environmental concern and activism in a rural industrializing area. The summer research students conducted field research on environmental activism, including ethnographic interviews and surveys. In addition to the field work, students developed tabular and GIS data resources related to demographic and socioeconomic characteristics of the study area population and the existing (and future projected) landscape of industrial facilities in the area to better understand the interplay of spatial and non-spatial considerations in environmental activism around these two issues. The student researchers used ArcGIS desktop software for the GIS and spatial components of the research and Nvivo software to analyze interviews, blog posts, news stories and survey results. The qualitative datasets developed in Nvivo were later developed into GIS data layers. “What is the best predictor of environmental activism rates in this case: income (average income or poverty), population size (rural-urban), or proximity?”. Students conducted a series of proximity analyses, evaluating the differences between wind distance, Euclidean distance and drive-time areas around the proposed tire incinerator in White Deer, PA. They learned how to perform areal interpolation to generate summary statistics on the demographic characteristics of populations living within different distance buffers around the proposed site. By the end of the final lab, students generated an output table that included summary demographics by municipality and a distance variable that could be used as input into a regression analysis. The project is moving forward on all fronts. With support from micro-grants funded out of our Andrew W. Mellon grant, student researchers continue to work on this project during the academic year. In spring and summer 2015, our team will present on this work at a series of conferences including the American Association of Geographers’ Annual Meeting, the ESRI User Conference and other venues.